The Pints and Pounds slot is a creation of the guys from Cryptologic. 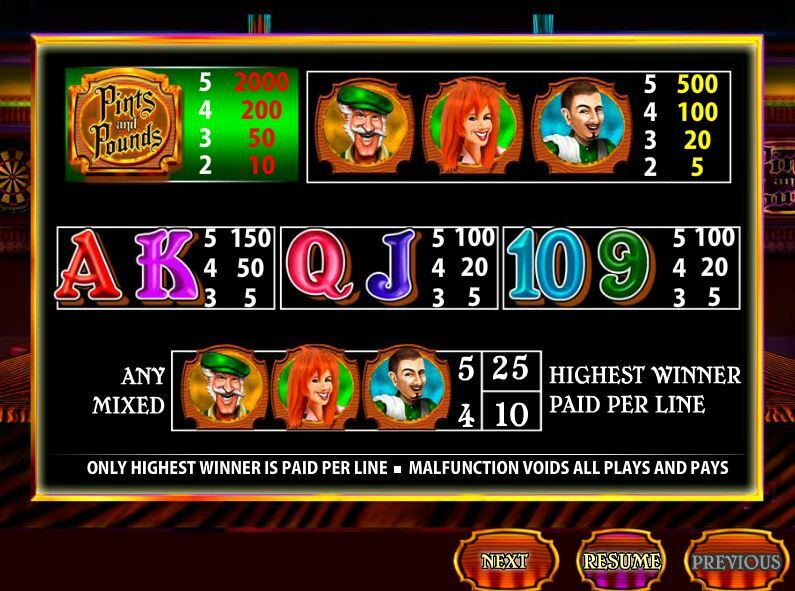 The theme of the slot shows you the inside of a typical English pub. With pints of beer and games of darts used for the symbols and the general design, Pints and Pounds actually looks like a half decent slot machine. There are enough embellishments to make it look good, so overall I think you’re going to have fun with it. It’s far from being the only slot with this kind of theme, as pubs and beer have been used as inspiration plenty of times in the past. 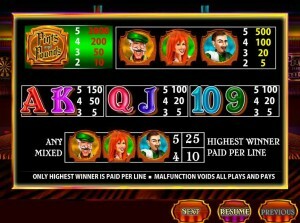 5 reels are part of Pints and Pounds, a game that can have up to 25 active lines each round. 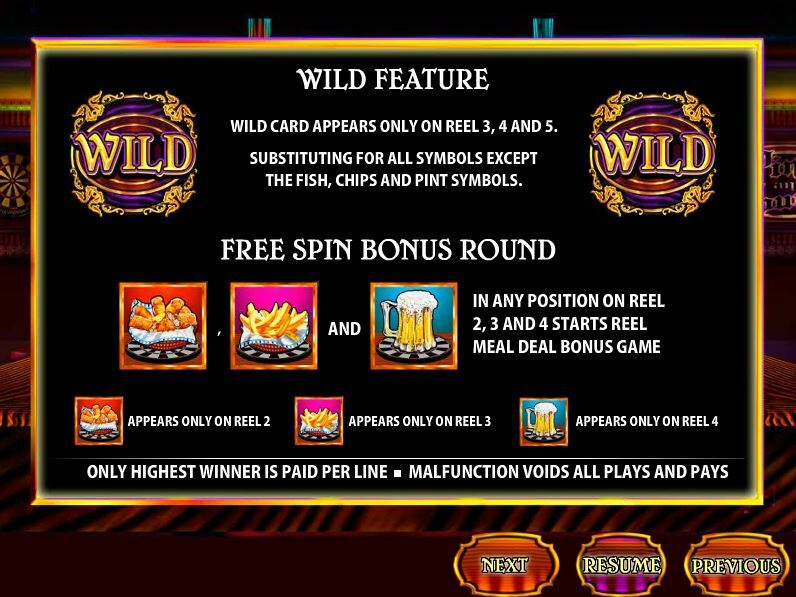 Wild cards, three different scatters and bonus games are available on the list of features, with the jackpot being a very attractive $40,000. 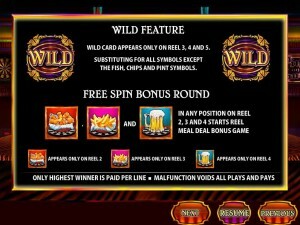 The game has wild cards, scatter symbols and bonus games which give you access to free spins. The first would be the wild card, using a beautifully decorated logo with the word WILD in the middle. This is a symbol which only appears on the 3rd, 4th and 5th reels. It can replace any symbol, with the exception of the three scattered symbols. This being a stacked wild, you will sometimes get a full reel occupied by it, while in other occasions you get only one or two symbols. 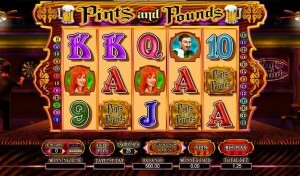 The bonus game of Pints and Pounds gets started when you have all three scatters present on the reels. There are three different scatters available in the game. 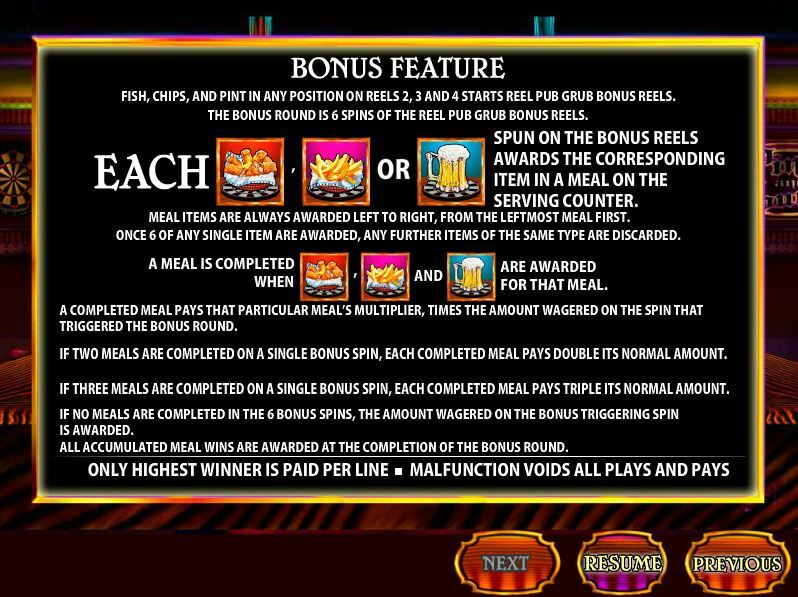 The Fish symbol is only visible on the 2nd reel, while the Chips icon is on the 3rd reel and the Pint of Beer is on the 4th reel. 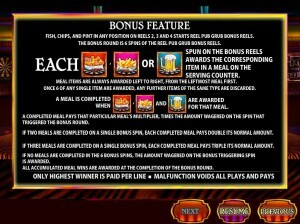 The feature offers you 6 spins, using bonus reels for it. Whenever you get one of the three scatter symbols while the bonus reels are used, you get an item of that type on the serving counter. If you manage to get six matching items, you no longer get additional ones. You need one fish, one chips and one beer to complete a meal, and if that happens you get a prize. Get two completed meals, and you win twice the normal amount. With three meals, you get triple the usual prize. The consolation prize, in case you don’t get any meals completed, is worth as much as the triggering bet. You are allowed to change the number of active lines and the denomination of the coins used on each one. Up to 25 active lines, plus line bets of $0.01 to $20, give you a total bet of up to $500. You can win 2,000 coins with a combo of five symbols with the Game Logo. The denominations being at the maximum value, the jackpot is worth $40,000. The action in Pints and Pounds takes place inside the pub. There are yellow reels, with wooden decorations visible all around them. In the back, you can see someone playing a game of darts on the left side, while the game logo is on the right. The symbols have plenty of details in them, but they look like they are designed for a higher resolution and they aren’t exactly right when played at a smaller one. Symbols: Wild Logo (wild), Fish (scatter), Chips (scatter), Beer (scatter), Pints and Pounds Logo (2,000x), Bar Client (500x), Redhead Girl (500x), Bartender (500x), Ace (150x), King (150x), Queen (100x), Jack (100x), 10 (100x) and 9 (100x). It’s a game with a better design that you might expect from a pub themed slot, with lots of details and decorations used, but its prizes are average at best. 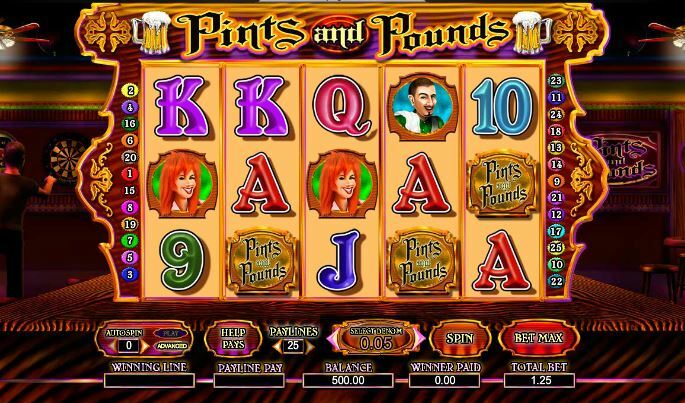 The Pints And Pounds slot machine is offered through the Cryptologic platform, so if you want to play it for real or just to practice, look out for casinos that use it.